On all major search engines, I am unable to find the website link for t.cloud. In this forum I saw many users complaining about the difficulty with t.cloud compare to other cloud services. My suggestions to Smartron if they want people to increase the usage of their services. 1. Give multiple platform access to t.cloud. 2. Build a proper user friendly website that people can easily find on the web. 3. Support maximum number of format for documents, images, contacts, apps and their data etc. with stronger built in integration with Smartron products. Without this 1000 GB of cloud storage is useless. 4. Make seamless auto sync possible for t.cloud. Bonus: You can build apps for Mac, Windows, Linux and Android for greater portability or just stick with a user friendly, well designed website to optimize cost. Thank you but I know the link. 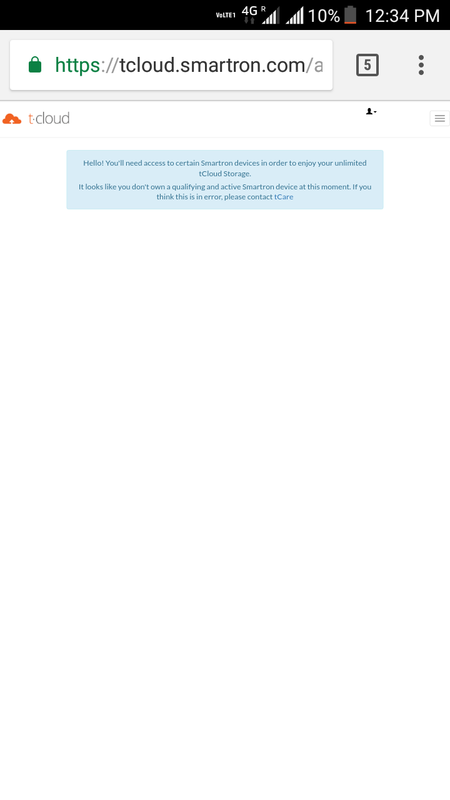 The point is no search engine was able to find this link and users are not able to login through other platforms. T.cloud should be flexible enough to available to smartron users through any platform. What I saw in error messages that the service is locked to only smartron devices. Without them you can't use the service. Digital services should be free from the platform centric model for greater usage which leads to more development & innovation. I understand the SEO part, but customers can access it using browsers from any devices. 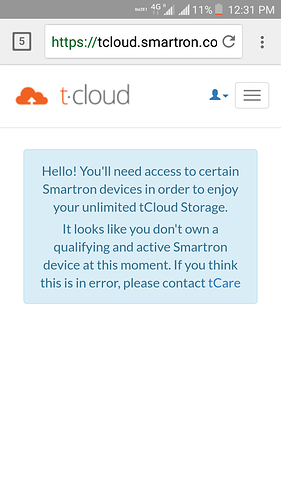 The service is limited to Smartron users, but the access isn't limited to Smartron devices. @Abhishek_TV Check out this screenshot and you will understand the issue. 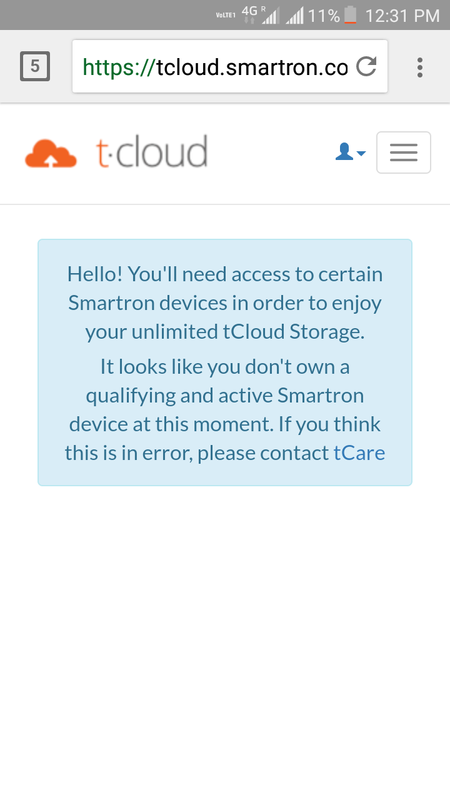 Yes, you need an active Smartron device in order to get the tcloud service. But once you have an active Smartron device logged into tcloud and other tronX services, you can access it from any browsers. Do you have an active Smartron device? Yes, @Abhishek_TV . I am using t.phone P. Will that be enough ? @Abhishek_TV Plz renovate the t.cloud app like Google drive or drop box for user friendly. Smartron services too miserable. few days back i face one new problem, my srt phone itself consume 2gb of jio data. After 2 days i Diogenes the problem, problem is tcloud consume all data. When i disabled it. Phone consume normal data asusual. Thank you for the feedback. We are working on improving the t.cloud and other tronX services. Hey, I have also faced similar problem. I have srt phone. 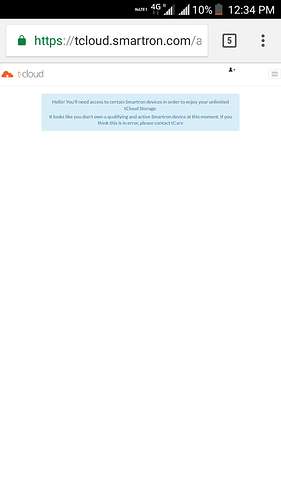 And I am unable to login in web version. Maybe because I had made two ids, one in Yahoo and one google. But now it's not working for me. Is it possible to merge two accounts? Hei @Abhishek_TV , can you please tell me whether tcloud has any API that we can utilize for data uploading and downloading programmatically from our web apps or something else ??? If not , I'd suggest you to tell your development team to add these API based services to tcloud , (as Google drive , Yandex drive or OneDrive etc ) . Cause you're about to bring an iot based connected future into India , it would be great if developer's can use your cloud services seamlessly , while integrating cloud service into their apps . Thanks for noting it down .